I have always been drawn to the mysticism and spirituality of India, particularly seen in the gurus, the sadhus, the Jains and the holy travellers. 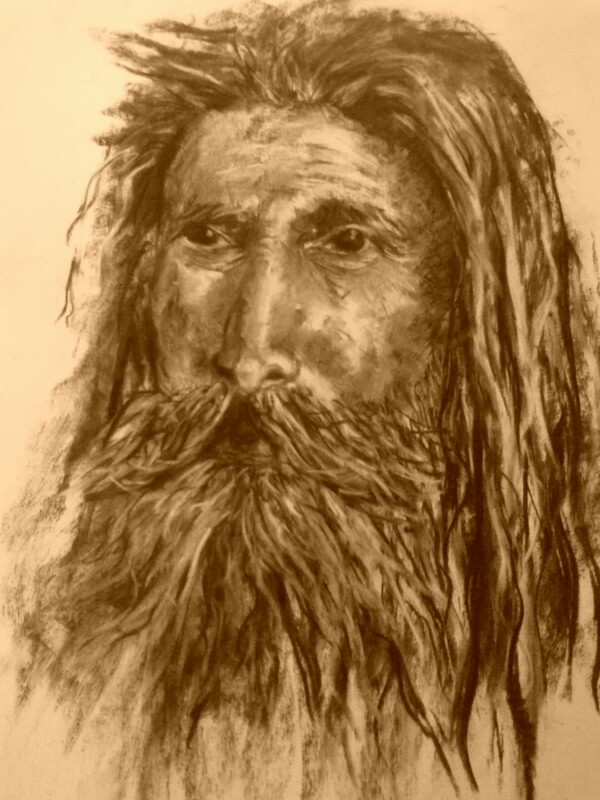 They say the eyes are mirrors of the soul – I see the eyes of a sadhu as a mirror to fathoms of wisdom gathered over thousands of years, as they journey on in solitude wearing little, eating little and spreading their knowledge in the most humble way. This drawing was done on a warm sunny Perth morning, standing at my crotchety easel . Armed with charcoal and paper, kneedable rubber, long black apron and wet rag, I had in mind to create a drawing that would go with the mood I was in, bearing in mind I was listening to Indian music. I found inspiration in an old photo that has travelled with me into my living spaces for many years and which has been blue tacked on to many walls . The end result looks nothing like the photo – it could be a completely different man, and I think perhaps I put a different character altogether into him. If you look more closely at his eyes and expression you could almost think he is a vagrant, a tramp, an itinerant . He could be the man I have seen sitting on the pavement in town, holding out a worn-out beanie, hoping for a few coins. There might be pain in his eyes – speaking of his hard life experiences. Or he could be a forest dweller, like the man on Grand Designs who built his home in the woods in England from timber collected from the forest floor. Perhaps he has a family – perhaps not. After 3 hours of drawing I had finished, and looking down at my very black hands I stood back and studied my man. I think on that warm sunny morning I had come back from my dreams of India and forest dwellers, and compassion for hard luck and the homeless – it didn’t really matter who he was – I felt I had accomplished what I set out to do-to create a piece that said something -I’m just not sure what ! How lovely to find an additional view / perspective / voice here; and accompanied by this marvelous drawing. Thank you Voice for your warm encouraging comments-I feel blessed-it feels like putting your soul out there for inspection ! Not talented algernon-but thank you anyway-just patient. Glad your daughter is doing life drawing -my favourite thing-very calming. It think you sell yourself short lindy. You’ve captured much of the character of the subject even down to the furrow on his brow. His unkempt hair and beard even down to the proportions of his face. I’m glad you shared this with us. I admire your drawing, lindyP. For me when I received it in my email it recalled a photograph I wrote about in a story. I very much enjoyed reading your description of yourself drawing and how it doesn’t look in your estimation like the photograph but moved you. I think that shows in the quality of the drawing. I felt in turn moved by the quality of your work. sandshoe, there’s plenty of talent here, you can paint/draw and write, so can Lehan, and the latest addition, Lindy, who is good at both. Gerard used to paint, teach and do etchings…now it’s only writing…. He’s got a new computer and is very frustrated that is not able to send the pictures of a painting we bought from Lehan; it’s hanging up and he was keen for Lehan to see it in its new home…. Very kind of you sandshoe-the photo I used didn’t have such an intense expression -maybe my music influenced my drawing! I love to draw to music-usually middle eastern music. Can you help with knowledge of artists and recordings, lindyP? Very good Lindy. The eyes have it, not and easy task doing it with charcoal. You managed to also keep the drawing spontaneous and not laboured. Thank you Gerard-yes I love charcoal -my favourite medium .I find its nice and loose and as you say -immediate,while using graphite you tend to get a more detailed slow result and sometimes lose the effect you want, and I don’t like photo-realism. I see you did etching-printmaking was what I majored in at RMIT. I concentrated on monoprints rather than etching. Lindy, you got the eyes right, very expressive, I believe the portrait painters often say that to get the likeness of the eyes right is half the battle…. Thank you helvi-I guess its the eyes that people look at first -even when you speak to someone.I hate looking at someone when I can’t see their eyes -people who wear sunglasses that you can’t see through -grrrr !!! I know -I’m old-fashioned !! It reminds me of a guy in London, who’s name eludes me at the moment. It also reminds me of people that I met in Nepal and Northern India. Quite Caucasian really. Of course the original gypsies came from Northern India to wend their way thought the middle east – to Europe. One can see characteristics in many modern faces. I envy you, being able to draw. One of my sons and his mother can. Indeed it doesn’t Lindy! He looks a well travelled man and thus a well seasoned one, one whose mind is full with questions as well as answers. A mind that is eager to speak as well as to listen. And a heart. One that holds every possible human emotion and which, like his mind, is eager to express them or to feel new ones. He could be David Thoreau or Socrates. What a brilliant drawing and what an excellent piece of writing, Lindy! Enormous thanks and please, do present us with more! I’ve taken up drawing again after a number of years not doing anything -I find it a wonderful therapy -like a meditation. karmami, spirituality and wisdom, alas, is not endowed to whole populations. We may feel gratified -but certainly not placated- by the fact that they exist in some men and women spread sparsely around the planet. Arn’t we all karmami ,and many of us are deeply troubled by barbaric practices all over the world (not least the western world which should know better) but I still feel very humbled by spirituality found in mostly eastern provinces -mostly hindu/buddhist -my hero is the Dalai Lama . Yoooooohooooooo! You got a minute? I’ve got this list of questions about the afterlife! Question number one. Do we ALL get balloons? Or is it just those who write our names on them who decide.